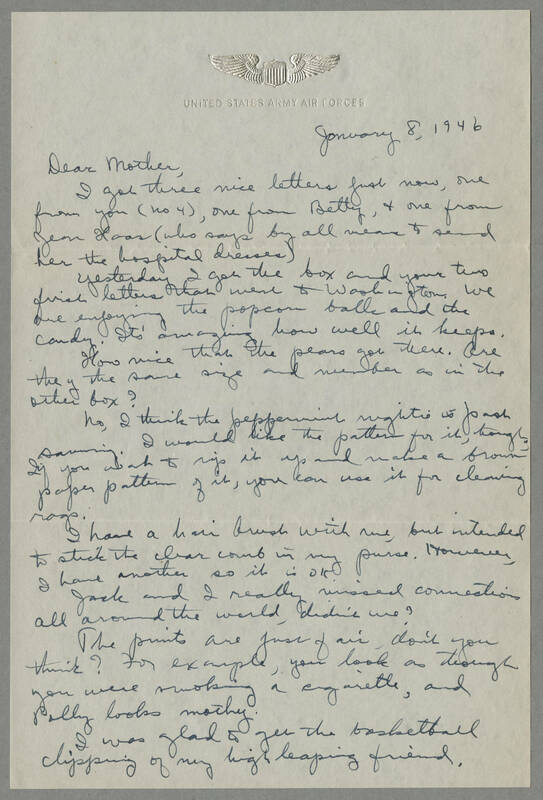 January 8, 1946 Dear Mother, I got three nice letters just now, one from you (no 4), one from Betty, & one from Jean Haas (who says by all means to send her the hospital dresses). Yesterday I got the box and your two first letters that went to Washington. We are enjoying the popcorn balls and the candy. It's amazing how well it keeps. How nice that the pears got there. Are they the same size and number as in the other box? No, I think the peppermint nightie is past saving. I would like the pattern for it, though. If you wish to rip it up and make a brown paper pattern of it, you can use it for cleaning rags. I have a hair brush with me, but intended to stick the clear comb in my purse. However, I have another so it is OK. Jack and I really missed connections all around the world, didn't we? The prints are just fair, don't you think? For example, you look as though you were smoking a cigarette, and Polly looks [mothy?]. I was glad to get the basketball clipping of my high leaping friend.